This is a great recipe for those times when you’re feeding a group of people with all kinds of dietary quirks, be it lactose in tolerance, gluten free, vegan, vegetarian or oil free. This salad meets every and all food restrictions including mine, the beet free diet. Because if you don’t want the beets, just take the salad from the on top. 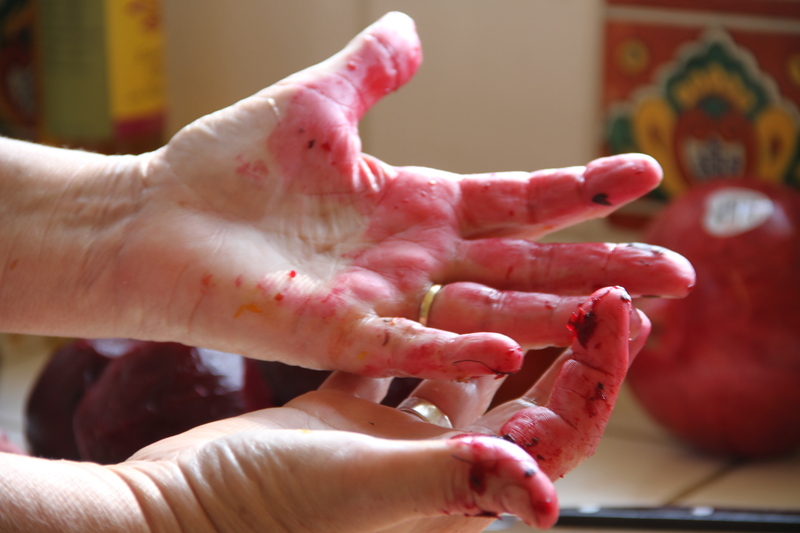 I like to use yellow or candy cane beets because they don’t stain my hand as much. This is great for the holiday as the beets can be roasted ahead of time. I slice by hand, you can use a mandolin. Sprinkle of sea salt if you have. Roast beets in 350 oven for 45 minutes or until done. Time depends on how large beets are. Cool beets. While beets cool off. In a medium sized bowl zest grapefruit, next cut away peel and cut sections into bowl. Squeeze the juice from remaining grapefruit pulp into bowl. 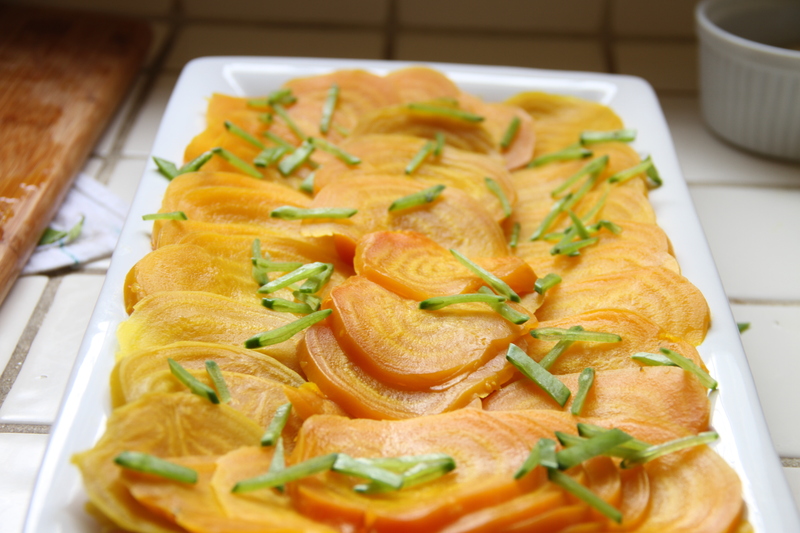 Slice beets using mandolin or your incredible knife skills. Placed sliced beets on serving dish. 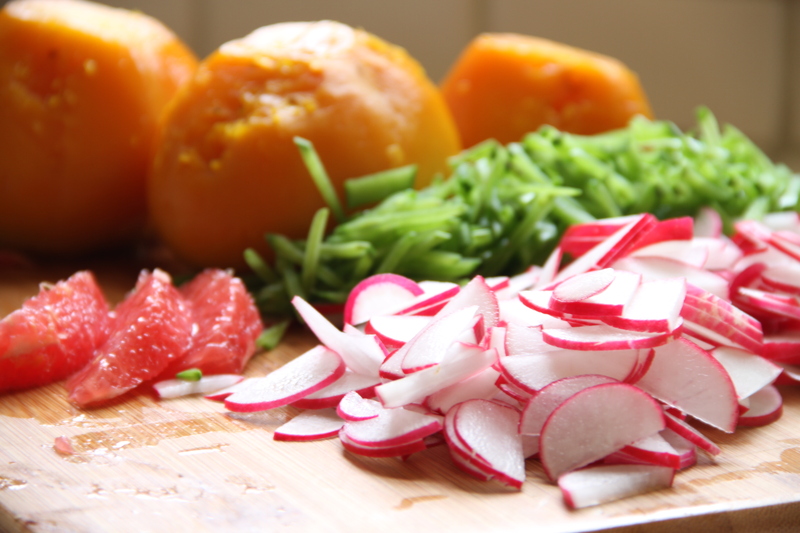 Sprinkle a few of the slice peas on top of sliced beets. 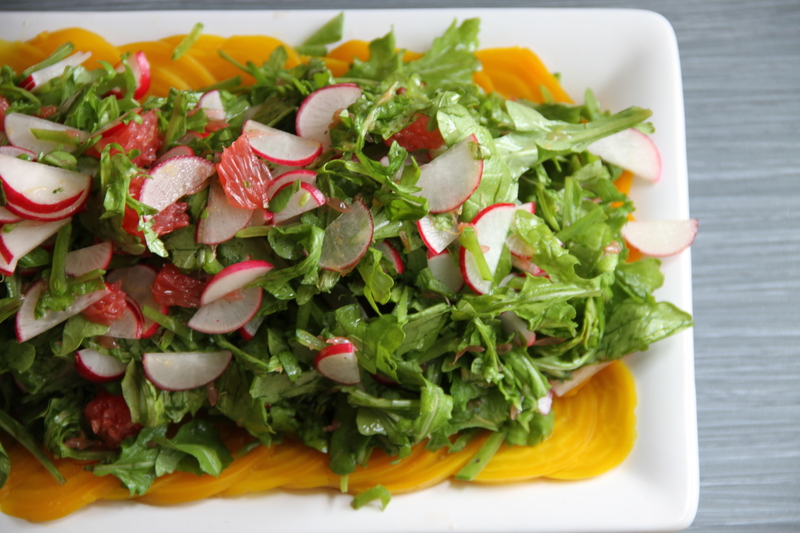 Add arugula to bowl with grapefruit and radishes. Toss. Place on top of sliced beets. Sprinkle with sea salt or salt. Serve. This salad was spectacular! I loved it! Beautiful dish Judy, beets are my all-time favorite. I love the combination with the radish and grapefruit. This is a must-try. How about if I keep the beets raw? That will work as well, won’t it? ….. It’ll be more vegan. Raw beets are perfectly fine as well. Then this dish would be raw and vegan. Love this and your photos are wonderful! Thank you for the inspiration today. Beets are something I don’t prepare that much and I hope to remedy that with your recipe. Thanks for stopping by Allison.